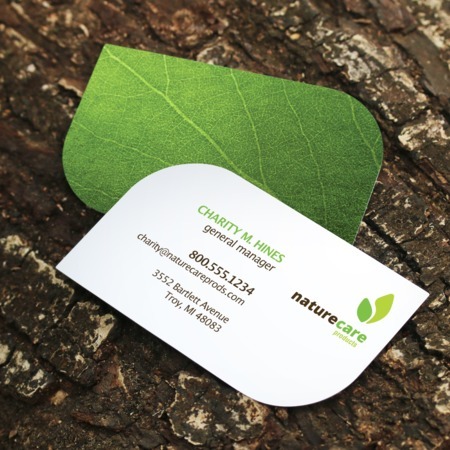 Shape your business with leaf-shaped die-cut business cards. Perfect for eco-friendly, landscaping, any green business, or any company looking for a cool new design. This die-cut shape will definitely catch the eye of every person who sees it. It makes them appropriate for small businesses related to the environment and health. They’re also a good match with florists and horticulture-related businesses. Business cards with die-cut shapes can be more expressive and creative when compared to standard business cards. At UPrinting, your leaf business card is printed on a 14 pt. gloss, matte, or high gloss cardstock. Print as few as 25 cards or as many as 10,000. Choose between a 2, 4, or 6 business-day turnaround.